A friend of mine who is a professional scuba diver, wanted a scuba themed cake for her daughter’s birthday. She sent me a picture for inspiration and then we made the necessary changes to personalize it. The bottom cake was 9″ diameter (3 layers) and the top was 5″ diameter (3 layers), lemon and strawberry cake (alternating layers) with lemon and strawberry buttercream icing (alternating layers). The cake included a fondant diver with pearl bubbles, as well as the necessary “under the sea” themed items such as shells, an octopus, star fish, etc. All of the decorations were made out of fondant except for the shells- those I bought pre-made and they were gumpaste. For the grass I cut thin strips of green fondant, made the top pointed a bit and then twisted them and allowed them to dry before adding them to the cake. 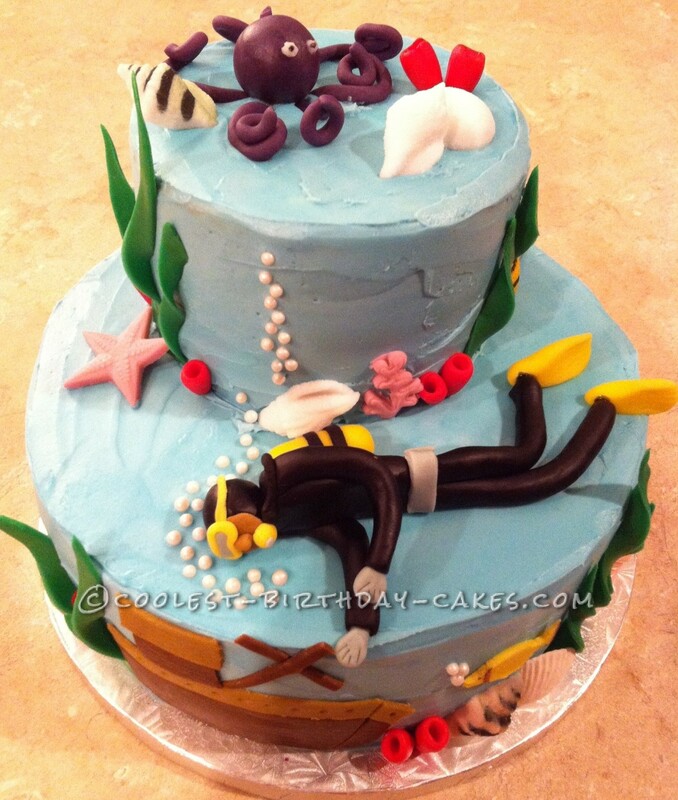 This scuba diver birthday cake was fun to make and delicious to eat. To this day it is still in my top 5 favorite cakes! !